First, the numerical result struggles to pass an intuitive “smell test”. As the Angry Bear blog [cross posted at EconoSpeak!] points out, employment in Seattle was booming throughout the period: average wages increased by 18 per cent (!) in the time covered by the study; as did the number of hours worked at all wage rates. It is important to note that the researchers have data on jobs, not on individual workers — so even if there are fewer low-paid jobs than before, it does not follow that workers have lost as many jobs rather than moved into better ones. Fifth, there is a simple arithmetical issue with the methodology. If "low-paid" is defined as below a fixed threshold wage ($19/hour in this study), higher average wage growth in one group relative to an initially similar control group will necessarily take more people out of the low-wage bracket. Such wage bracket creep means that the higher wage growth will "cause" a "loss" of low-wage work through mechanical arithmetics even if nothing causal is happening (indeed even if everyone stays in the same job). In Jidda, according to the New York Times today. So the story about the now deposed 57-year old former Crown Prince of Saudi Arabia and former Minister of the Interior, Muhammed bin Nayef (MbN), putting out a video supporting his own removal appears to be phony propaganda. The Saudis instead have been broadcasting a video of the new Crown Prince, 31-year old Muhammed bin Salman (MbS) kissing the hand of (MbN). Presumably he did that back in the day when MbN was the Crown Prince and MbS was his supposed loyal deputy. We have no video of MbN kissing the hand of MbS. As it is, the story also reports that when MbS's elevation was announced, MbN returned to his palace to find his guards replaced by ones loyal to his successor. He and his daughters have since been confined to the palace and also forbidden to leave the country, although the latter would seem to be impossible if they cannot leave the palace. MbN has been replaced as Minister of the Interior by his nephew, Muhammed bin Saud bin Nayef, whose father is governor of the Eastern Province. Reportedly US intelligence officials are "outraged" at this, having worked long and well with MbN, who was reportedly the key figure behind squashing al Qaeda in Saudi Arabia, He is viewed by these people as very competent, and his successor has apparently no experience at all in the area. Wonderful. But these people are constrained from speaking openly because of the clear support by President Trump and his son-in-law, Jared Kushner, of the elevation of MbS, as well as his aggressive warmongering in Yemen, against Qatar, and also against Iran. Of course, we have also seen the spectacle of SecState Rex Tillerson repeatedly making it clear that he at least does not support the diplomatic and economic moves against Qatar. SecDef Mattis has laid lower on the matter, but has also made it clear that the US intends to maintain its major CENTCOM air base in Qatar and is engaging in actions such as selling Qatar fresh fighter jets that go completely against the Saudi-led move that has been pushed by the warmongering and irresponsible new Crown Prince, Muhammed bin Salman, so stupidly supported by our lunatic president. In any case, the confinement of Muhammed bin Nayef to his palace suggests that not only does he not accept his double demotion, but that King Salman and his pushy but apparently incompetent son are afraid that all this may not go over all that well with other senior members of the royal family, so MbN must be kept out of public attention, although confining him like this might back fire, just as the failed efforts to militarily escalate in Yemen, not to mention to isolate Qatar, appear to be doing. Oh, King Salman has also now appointed another son, 28-year old Khalid bin Salman, to be ambassador to the US. Let us hope he is not as gonzo off-the-wall as his brother. Oh, and on the matter of the late Hassa bint Ahmed al-Sudairi, mother of the current king, I have been unable to find when she really died. The source for the Wikipedia entry and pretty much everything else out there readily accessible claim that she died in 1969 is a 2005 article in the Daily Telegraph, with no identified author, on the death of her most powerful son, the late King Fahd. Deep in the article his mother was mentioned, along with the claim she died in 1969. But I know from primary sources that she was alive much later and running the country through her sons, whom she demanded regular meetings with and complete obeisance to her wishes. I checked the authoritative book from 1981 by Robert Lacey, The Kingdom. He reports on how Abdulaziz went for her as a child and first married her when she was 13. She had a son for him, Sa'ad, who died early, after when Abdlulaziz divorced her, so she married his brother, Muhammed. But Abdulazis was in love with her, reportedly beautiful as well as strong-willed, and he later made Muhammed divorce her, although she produced sons for him, and he remarried her, keeping her as a wife until his death. It was during this second marriage that she produced the Sudairi Seven, one of whom, Salman, is now king. Lacey does not report on her having died in his 1981 book. There has been a lot of very good critique of the methodology of the University of Washington's study of the minimum wage increase in Seattle. However, I want to repeat and emphasize a very simple point that jumps out. 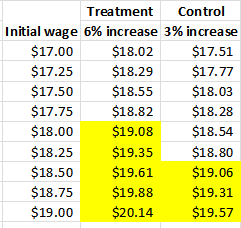 A static low-wage cutoff point, whether it be $19 or $100, automatically reduces the size of the treatment group (Seattle) if wages in the treatment group are increasing faster than the wage of the control group. See how much worse off the treatment group is than the control group? The yellow cell occupants haven't lost their jobs, they have simply been excluded from their respective groups because their wage now exceeds the static cutoff amount. Of course, I wondered if the study authors could be making such a simple arithmetic mistake. So I reached out to one of the authors, who generously replied but appeared to confirm that they relied on a static threshold. I say appeared because some of the replies were, shall we say, "ambiguous" but did not disclaim use of a static threshold when I sought explicit confirmation or denial. Bear with me. I’m going to try out an idea that may be completely off-base, or maybe not. I would very much like to hear what you think of it. When I was young, long ago, organizations sometimes employed a few counselors or advocates, people whose job was to help clients or other members of the public navigate the bureaucratic tangle of rules, forms, preconditions and other procedures that often stood between them and and the benefits they sought to obtain. A hospital, for instance, might employ a patient advocate who could advise how to access care that, in principle, ought to be available to all. When I was an undergraduate there was a small advising office at my university that helped students figure out how to complete their requirements and get the services and support they needed. I have the impression that, in the last few decades, this job category has rapidly expanded, not only in the number of its practitioners but also the scope of their assignment. This trend has attracted a lot of attention in higher education, where counseling has expanded at the expense of teaching, at least in its increasing command of limited budgets. Other social service organizations have turned to counselors, advocates, advisors and similar sorts in increasing numbers. And counseling has taken on a new ideology, a particular way of defining the set of problems it addresses and the forms solutions should take. The old, narrow understanding was that people often lacked knowledge of available resources and the procedures for accessing them. The solution was conveying the relevant information or maybe even changing the rules. Many counselors still practice this art. But there is also a new view that the core problem is disempowerment, a psychological condition that prevents people from solving their own problems. The solution is (of course) empowerment via facilitation whose purpose is to invoke a sense of agency on the part of clients, so people can make decisions they feel comfortable with. The old view of counseling located the problems of this world in institutions—their complexities and irrationalities. The new view identifies the core problem as a need for a different type of consciousness. Now take a further step: suppose this ideology centered on the transformation of consciousness has spread its influence widely through our culture. One marker might be the distinctive language that “counselorship” employs. I haven’t investigated the matter quantitatively, but my impression is that the phrase “advocate for” has steadily displaced “advocate” in a wide range of uses in recent decades. Once upon a time, one advocated policies and occasionally, if one were in the counseling trade, one advocated for a client or group that needed support. Roughly speaking, if you were for the means to achieve a goal, like a law or policy initiative, you advocated it, and on those rare occasions when you were speaking on behalf of particular human beings (who are ends in themselves) you advocated for them. But now most English speakers are advocates for exclusively: they advocate for lower or higher taxes, fuel efficiency standards, whatever. Counseling language has taken over. Perhaps the counseling perspective has begun to transform politics as well. If so, we would see a tendency to redefine problems away from the discussion of particular laws or procedures and toward new mindsets/paradigms/discourses/consciousnesses that, by empowering the oppressed or aggrieved, constitute in themselves the objectives of political action. According to such a perspective, the problem of climate change, to take one example, is not explained by quantitative accounts of the carbon cycle and fossil fuel releases, but as stemming from a failure of consciousness. People have been disempowered by false conceptions of the true costs and benefits of consumption, their relationship to nature, etc., and “solving” the problem must take the form of transforming consciousness along these dimensions. What I’m trying to understand is this: I could agree that altering consciousness would be important if it were part of a thought-out political strategy. Imagine the argument went something like, “if we change the consciousness of x% of the population, they will vote for politicians who will enact laws that restrict carbon extraction, and so on”—then yes, consciousness change is important. (I don’t think this is how political change happens, but that’s a topic for another day.) But I sense a widespread commitment to a type of politics in which consciousness change is the whole story; it’s not an element in a larger process—it is the process. It could be that the perspective centered on transformation of consciousness is actually driving the spread of counseling-ism, rather than taking hold as a result of it. I might be confusing cause and effect. Or maybe it’s just coincidental. I need help in understanding this. What I do think I am observing, though, is a systematic shift, especially in large parts of the left, toward a view that social problems and solutions can be understood almost entirely as deficiencies of consciousness (“colonized” by oppressive mindsets) to be overcome by transformations of consciousness that empower the marginalized and dispossessed. I don’t know what empirical evidence would look like on this topic. I am proceeding from a small set of case studies, including one I have been living through intimately at my place of work. At this point, if an explanation seems to work for a particular case, that’s a point in its favor. Useful responses to this very speculative blog post would take the form of cases that either exhibit or contradict its argument. Yeah, I know, Marx wrote three volumes on this, and in 2014 Piketty published in English a more than 700 page book on it that ended up on the bestseller list, although neither of these resolved the long-running debates about the nature of profit or of capital, which continue to swirl. We have seen recently someone claiming that distinguishing between retained and distributed earnings is the key to understanding profit, and failing to do so means all of economics as we know it is wrong. But then there have been many other views that this view does not remotely address. Regarding capital itself, which profit is usually thought of as being one of the sources of income related to, let me quote the following that notes a range of views out there. From Catastrophe to Chaos: A General Theory of Economic Discontinuities, Kluwer, 1991, p. 125. I leave it the imagination (or googling) of the reader as to who the author of that book is, although I note that the quotation appeared in the second edition of the book that came out in 2000. So there are surface issues regarding the nature of profit and capital, and there are deeper issues. This quotation lists some of the deeper arguments that have been made by different schools of economics. The "pile of produced means of production" is basically a Principles textbook orthodox position, which rules out financial definitions, with many "people in the street " thinking it is an "accumulated pile of finance," a later answer in the list. People teaching intro econ courses like to pound on wrongness of this popular view, ultimately falling back on the argument that capital is a "factor of production," which means that whatever it is one must be able to use it in actual production processes." Machinery and buildings and other such "produced means of production" do that, so they count, and the building of them is what "real investment" is, not just somebody using some money to buy some financial assets, which is what the person in the street usually means by "investing my capital." We spend lots of time disabusing them of their delusions, we who know that "money is an illusion," and that while finance is very important in the functioning of modern economies, piles of money or financial assets do not in and of themselves actually produce something. Rather they are indicators and means for determining who gets to own those actually productive forms of "real capital," oh to throw out another term. So some of the later definitions seek to get at the foundations of where this producing of these productive means of production come from, all that "real capital investment." So, if we are inclined to a Ricardo or Marx labor theory of value view, then all we see about is either produced by current or past labor. That truck over there was put together by workers with machines in a factory, with those machines made by worker and some other machines, which in turn were made further in the past by yet other workers and other machines, and so on and on until we can reduce all of those produced means of production to being really a bunch of current labor plus a whole string of past labor going way back into the depths of time from many many now-dead workers. Curiously, although the Austrians abjure the labor theory of value, the theory of "roundaboutness" is theirs, notably Bohm-Bawerk anyway, and he derived it precisely from looking at this sort of Ricardo-Marx argument that I laid out. So past time gets dragged in, with the longer that stream of past labor goes into the past, well, the more roundaboutness, and this is what he said was capital, and to get at another question raised, how it came to be an "independent source of value," from just current labor time. But dragging in time gets us to"waiting," which also drags in finance, given that we are talking about saving, which is usually done by piling up financial assets of one sort or another, some of which may pay yet another source of capital income, namely interest. Proto-neoclassical, Nassau Senior, got on this one, although this is deeply part of the official neoclassical canon, which in the formulation of Irving Fisher had the real rate of interest being that which established the intertemporal equilibrium between the willingness to wait by not consuming today, and effectively the marginal product of infestment, or capital is you prefer, coming from the production side, those produced means of production, with an implicit assumption that what does not get consumed and so saved, ends up being invested to create that "real capital," waiting being crucial to all this. Of course the "social relation" answer is the deeper Marxist view, the part that distinguishes Marx from Ricardo. Quite aside from this there is the surface aspect of profit and capital, which turns out to be quite complicated, even the trivial surface matter of accounting to measure it. I said in an earlier post that it is at one level simple, for a firm at least, profit is revenues minus costs. But agreeing on the proper accounting measure of that gets messy, even for the simplest of firms. One has to pick a time unit, although a year is pretty conventional for tax reasons, if nothing else. But what gets counted as revenues? Sales? How about money gained from lawsuits? How about money from illegal bribes that is unreported? And none of this, not the deeper issues, nor even the surface accounting issues, are remotely resolved by declaring that one must focus on the division between retained and distributed earnings. Heck, that does not even fully explain firm investments, as only about half of the funding for investments comes from retained earnings, at least in the US economy. But, maybe this does not matter if one is trying to build a general theory of all economics on such a shallow and empty accounting identity. Addendum: There is far far far more I could talk about here, but let me add just a few remarks on one issue that has had a lot of attention recently, the rising share of capital income at the aggregate level, which, whle not the whole explanation of it, has correlated with the rising income inequality going on in most nations of the world during the last several decades. Of course this was the main theme of Piketty's book. He had the data, but his theoretical explanations drew lots of criticism, including from me. He fell back on his r> g argument, which was good for marketing the book, but was easily shown not to do the trick to explain the rising capital income share even on a garden variety aggregate neoclassical production function analysis. Of course, Cobb-Douglas such functions are useless in this matter as they generate constant factor shares. And then there is the whole Cambridge capital theory critique of aggregate capital and aggregate production functions, ironically a critique at least partly shared by more sophisticated Austrian economists as well. Many dumped on him for throwing in land with the capital stock and returns to land as capital income, which some have argued carries a lot of the weight on the empirical findings. In the end when pushed, he has tended to fall back on waving his hands about politics and the collapse of unions and social-political power trends for at least part of his explanation, which looks to me to be playing a big part of it. Needless to say, focusing on the division between retained versus distributed profits does not remotely address the question of how much of national income is going to capital forms of income. Words cannot describe the torment experienced by the data before they confessed what the University of Washington team got them to confess. I can only urge readers with an open mind to study Table 3 carefully. The average wage increase, from the second quarter of 2014 to the third quarter of 2016, for all employees of single site establishments was 18 percent. Eighteen percent! That is an annual increase of almost 8 percent. For two and a quarter years in a row. Not bad. And the number of hours worked of ALL employees of single site establishments? Up 18 percent in a little over two years. That too is an increase of almost 8 percent per annum. Now multiply that wage by those hours and the total payroll for all employees rose 39.5 percent over the course of nine quarters. An annual rate of increase of 17.5 percent. These are BIG numbers. They are freaking HUGE numbers. It must have taken a team of at least six academics to extract a 9.4 percent decline in hours from the 86,842 workers (out of a total of 336,517) earning under $19 dollars an hour at these single-site establishments. Look at the Table and weep. Now, as I mentioned in a comment on Peter's post, bracket creep alone could do away with at least 7 percent of the missing hours of workers earning under $19 and hour. That is unless we assume that everyone making between about $18 and $19 got approximately zero wage increases while the rest of the crew were getting 10 percent raises. Look at the God damned table. This isn't rocket science. As labor market mavens all know by now, the University of Washington team chosen by the city of Seattle to evaluate its minimum wage law has issued a new report. This one is particularly juicy since it covers the increase from $11 to $13 an hour, which moved Seattle into new territory, beyond what has been studied elsewhere. The report makes much of its use of Washington State data which include not only numbers but also hours worked, allowing (in this respect) a more precise analysis of the effect of changes in the statutory minimum on employment. Our preferred estimates suggest that the Seattle Minimum Wage Ordinance caused hours worked by low-skilled workers (i.e., those earning under $19 per hour) to fall by 9.4% during the three quarters when the minimum wage was $13 per hour, resulting in a loss of 3.5 million hours worked per calendar quarter. Alternative estimates show the number of low-wage jobs declined by 6.8%, which represents a loss of more than 5,000 jobs. These estimates are robust to cutoffs other than $19. A 3.1% increase in wages in jobs that paid less than $19 coupled with a 9.4% loss in hours yields a labor demand elasticity of roughly -3.0, and this large elasticity estimate is robust to other cutoffs. This has got the labor econ blogosphere quite excited: finally, after years of published studies that largely downplayed the labor demand disincentive effects of minimum wage laws, a report has been issued that finds immense negative effects—vastly larger in fact than those that have appeared in the past. The backdrop to this, of course, is the economic performance of the city of Seattle itself, which has been about as strong as any city in the country. During the period of the latest minimum wage increase Seattle has experienced essentially full employment, as reflected in an unemployment rate of about 3%. Thus, any negative impact in one part of the city’s economy had to have been offset by positive impacts elsewhere. And this in fact is also a finding of the Seattle minimum wage study, although its authors don’t mention it. They restrict their sample of affected workers to those in the low wage labor market, and they employ a range of cutoffs to see how truncating the sample in different ways affect their results, but their empirical methods intrinsically apply to workers at all wage levels. This is because their strategy for identifying employment impacts is to use various control groups, actual or synthetic, and compare employment between Seattle and these controls before and after the change in the minimum wage. The employment impact is whatever comes out of this comparison. Well, guess what? The treatment-versus-control methods that generate employment losses in the lower-wage segment of the labor market are nearly exactly offset by employment gains in the higher wage segment. This stands to reason, because Seattle as a whole is doing great: it hasn’t suffered overall from the rise in minimum wages, so dips in some parts of its economy imply bumps in others. The spurious results are clear in the case of the restaurant industry, as we illustrate in Figure B, where the authors’ own methodology and estimates imply that the Seattle minimum wage increase caused an incredible 20.1 percent growth in restaurant jobs paying above $19.00 per hour. While this number is not directly reported in their paper, it can be precisely inferred from their other results. To make this inference, we first note that when Jardim et al. focus on the restaurant industry, they estimate that the minimum wage increase to $13.00 caused restaurant jobs paying less than $19.00 hour to fall by an average of 10.7 percent (see their Table 9, averaging the estimates provided for the employment fall in 2016). At the same time, they find that the minimum wage caused essentially zero change in the number of all restaurant jobs, regardless of their wage rate. Because jobs under $19.00 comprised 65.4 percent of the restaurant industry prior to the first minimum wage increase (see Jardim et al.’s Table 3 for the 2014Q2–2015Q1 period), and because these jobs shrank by 10.7 percent while overall employment held steady, it follows that Jardim et al.’s estimates imply that the Seattle minimum wage increased the number of restaurant jobs paying over $19.00 per hour by about 20.1 percent. 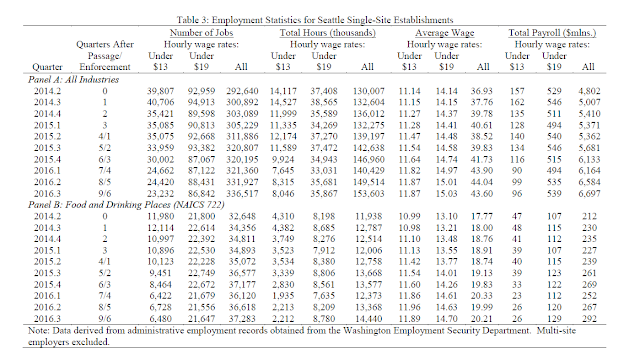 Remember that these employment estimates are based on comparisons of Seattle to its constructed controls; measured differences are assumed to be due solely to the minimum wage hike that took place in Seattle but not in the comparitors. One interpretation is that the Seattle study’s methodology didn’t sufficiently control for factors that have caused upward movements in wages (moving workers out of lower and into higher wage categories) in Seattle compared to other communities. That’s what the EPI folks think. I prefer to take the results at face value: by increasing the minimum wage we can, by some currently unknown process, cause a big upward shift in wages, not just around the minimum, but all the way up to the stratospheric reaches of the labor market. That negative elasticity for the lower-paid is fully offset by a positive elasticity for the middle and upper class. "If you ask the man in the street (not Wall Street) what has caused our unemployment, nine times out of ten he will say that it is machines displacing people. In fact for this reason he is often deeply pessimistic about whether we could ever have full employment again." In your 1986 book, "How to Beat Unemployment," you wrote: "If you ask the man in the street (not Wall Street) what has caused our unemployment, nine times out of ten he will say that it is machines displacing people. In fact for this reason he is often deeply pessimistic about whether we could ever have full employment again." I am curious. Did you ask "the man in the street"? Les économistes dominants pensent que leur «science» a réalisé des progrès fulgurants depuis sa naissance. L’un deux a ainsi pu affirmer que les connaissances économiques de Marx et Malthus «étaient par rapport à ce que nous savons aujourd’hui ce que l’automobile de Cugnot [1725-1804] était par rapport à nos formules 1» . Et, de manière cohérente, ils cherchent à exclure l’histoire de la pensée économique des programmes universitaires. On peut très bien défendre la thèse inverse: la discipline économique est au contraire caractérisée par la récurrence de débats dont les termes ne changent pas vraiment, en dépit des habillages modernes. Ce n’est après tout pas étonnant, dans la mesure où les rapports sociaux capitalistes sont fondamentalement invariants. Le débat sur le partage du travail est une bonne illustration de cette proposition. Remember when Say's Law immediately sank without trace once Keynes debunked it? § 4. After every crisis, in every period of commercial depression, it is said that supply is in excess of demand. Of course there may easily be an excessive supply of some particular commodities; so much cloth and furniture and cutlery may have been made that they cannot be sold at a remunerative price. But something more than this is meant. For after a crisis the warehouses are overstocked with goods in almost every important trade; scarcely any trade can continue undiminished production so as to afford a good rate of profits to capital and a good rate of wages to labour. And it is thought that this state of things is one of general over-production. We shall however find that it really is nothing but a state of commercial disorganization; and that the remedy for it is a revival of confidence. To begin with, it is clear that, as Mill says, "What constitutes the means of payment for commodities is simply commodities. Each person's means of paying for the productions of other people consist of those which he himself possesses. All sellers are inevitably, and by the meaning of the word, buyers. Could we suddenly double the productive powers of the country, we should double the supply of commodities in every market; but we should, by the same stroke, double the purchasing power. Everybody would bring a double demand as well as supply; everybody would be able to buy twice as much, because every one would have twice as much to offer in exchange." But though men have the power to purchase they may not choose to use it. For when confidence has been shaken by failures, capital cannot be got to start new companies or extend old ones. Projects for new railways meet with no favour, ships lie idle, and there are no orders for new ships. There is scarcely any demand for the work of navvies, and not much for the work of the building and the engine-making trades. In short there is but little occupation in any of the trades which make Fixed capital. Those whose skill and capital is specialised in these trades are earning little, and therefore buying little of the produce of other trades. Other trades, finding a poor market for their goods, produce less; they earn less, and therefore they buy less; the diminution of the demand for their wares makes them demand less of other trades. Thus commercial disorganization spreads, the disorganization of one trade throws others out of gear, and they react on it and increase its disorganization. The chief cause of the evil is a want of confidence. The greater part of it could be removed almost in an instant if confidence could return, touch all industries with her magic wand, and make them continue their production and their demand for the wares of others. If all trades which make goods for direct consumption agreed to work on and to buy each other's goods as in ordinary times, they would supply one another with the means of earning a moderate rate of profits and of wages. "If There Is Any Such Thing": Why read Hoxie on theory? Paul Samuelson once wrote that it takes a theory to kill a theory. He didn't say it had to be a better theory. What would it take to kill a theory that never was? The Sandwichman's summer project has been to consolidate my research and blog posts on the lump of labor from the last ten years into something like -- and yet unlike -- "the archaic stillness of the book." Sometimes, when cross checking old sources, new sources spring up out of the archives and one of the most astonishing was Robert Hoxie's commentary on what he called "fixed group demand theory." The term appears elsewhere only in a few sources: a dictionary entry on the lump-of-labor theory in What's What in the Labor Movement: A Dictionary of Labor Affairs and Labor Terminology (1921) by Waldo Ralph Browne, in The Settlement of Wage Disputes (1921) by Herbert Feis, whose discussion mainly centered on Hoxie's analysis, and Warren Gartman made a brief, parenthetical reference to the theory in a 1950 report on Longshore Labor Relations on the Pacific Coast, 1934-50. By far the most substantive treatment of fixed group demand theory was in Edward M. Arnos's 1915 article, "An Interpretation of the Working Rules of the Carpenters' Unions of Chicago." Arnos was a doctoral student at the University of Chicago at the time when Hoxie was conducting his research on organized labor's views on the Taylor method ("scientific management") and Hoxie engaged his students in the research project. Hoxie also wrote on the concept of fixed group demand previously without using the terminology. I reproduce both Arnos's and Hoxie's discussion below. Hoxie's novel method was to ask people why they did something. Appendix II of his Trade Unionism in the United States contains an 18 page outline and summary of the "students' report on trade union program." Appendix VIII of Hoxie's Scientific Management and Labor presents over 100 pages of questions used by Hoxie in that study. In the latter study, Hoxie prepared preliminary statements based on extensive reviews of the literature, summarizing the labor claims made by scientific management and the objections to scientific management by unions. He then circulated the summaries to proponents of scientific management and labor leaders, respectively, for their revision and approval. By his own account, Arnos's investigation followed similarly thorough methods. The point of such rigorous investigation was not to vindicate or invalidate the theories in question but to examine their claims in the light of experience. The outcome was not a triumph for one theory and a defeat for another -- a sorting into economic laws and economic fallacies -- but an assessment of the extent to which each of the competing theories had merit and their respective limitations. Hoxie operated in the spirit of ethical debate as latter proposed by Anatol Rapoport. There are two aspects of Hoxie's discussion of fixed group demand theory I would like to emphasize. The first is his explanation of unions' restrictive rules as pragmatic, opportunistic measures adopted locally and retained through trial and error rather than in accordance with some overarching "theory" of how the economy works. The second is a subtle but devastating critique of the pretension of economic theory to apply simultaneously to both the universal long run and to local immediacy. In Trade Unionism in the United States, Hoxie rhetorically affirmed the validity of the classical economic analysis "when applied to society as a whole, if there is any such thing, and in the long run" while objecting that for workers, "there is no society as a whole, and no long run, but immediate need and rival social groups." A few years later, Maynard Keynes echoed the assessment that "this long run is a misleading guide to current affairs." Apparently it rarely occurs to the employer that this analysis is not complete. Having assumed that definite laws determine the manner in which income is shared among the productive factors, he apparently concludes, somewhat naively, that just as the laborers in society will in the aggregate profit by increase in the social income, so also will the laborers in any individual establishment profit by increase in its income. Hoxie's "employer" is simply parroting the old "Say's Law" truism that, as Alfred Marshall put it, "the demand for work comes from the National Dividend; that is, it comes from work: the less work there is of one kind, the less demand there is for work of other kinds; and if labour were scarce, fewer enterprises would be undertaken." Marshall's "national dividend" was an updated and sanitized label for what a decade earlier in The Economics of Industry, he still referred to as the "wages-and-profits fund," which was too close to the discredited wages-fund to escape scrutiny. The bottom line, though, remained that "there is no such thing as general overproduction." There is only ever "commercial disorganization; and that the remedy for it is a revival of confidence." Although Marshall didn't mention this, it follows from his analysis of the impossibility of overproduction that in a crisis entrepreneurs commit the lump of confidence fallacy (or the fallacy of the fixed Confidence-fund). If only they understood how the "magic wand" of confidence works. Nor did Marshall happen to mention that the employers' stock remedies for hard times of cutting wages and/or laying off workers simply reflects their obliviousness to the fact that "there is no such thing as general overproduction." The one fatal heresy in economic analysis is to take output as given. That is the 'lump of output' fallacy. You must always have a theory of how output is determined and you must never say, 'Higher output per worker reduces employment, because it reduces the employment needed to produce a given output'. Likewise you must never say 'More people cause unemployment', unless you can explain why output will not grow. But enough about the magic confidence wand (if there is any such thing). Below is some true grit from Hoxie and Arnos. The third charge against the unionist which we have undertaken to examine states that while he is struggling for increase of wages he is at the same time attempting to reduce the efficiency of labor and the amount of the output. In other words, while he is calling upon the employer for more of the means of life he is doing much to block the efforts of the employer to increase those means. There is no doubt that this charge is to a great extent true. In reasoning upon this matter the employer, viewing competitive society as a whole, assumes that actual or prospective increase in the goods' output means the bidding-up of wages by employers anxious to invest profitably increasing social income. It follows that in competitive society laborers as a whole stand to gain with improvements in industrial effort and process. In the case of the individual competitive establishment it is clear that the maximum income is ordinarily to be sought in the highest possible efficiency, resulting in increased industrial output. At least this is true where there are numerous establishments of fairly equal capacity producing competitively from the same market. Under such circumstances the increased output of any one establishment due to "speeding up" will ordinarily have but a slight, if any, appreciable effect on price. Each individual entrepreneur, therefore, is justified in assuming a fixed price for his product and in reckoning on increase of income from increase of efficiency and industrial product. Apparently it rarely occurs to the employer that this analysis is not complete. Having assumed that definite laws determine the manner in which income is shared among the productive factors, he apparently concludes, somewhat naively, that just as the laborers in society will in the aggregate profit by increase in the social income, so also will the laborers in any individual establishment profit by increase in its income. To this mode of reasoning, and to the conclusions reached through it, the unionist takes very decided exceptions. To the statement that labor as a whole stands to gain through any increase in the social dividend he returns the obvious answer that labor as a whole is a mere academic conception; that labor as a whole may gain while the individual laborer starves. His concern is with his own wage-rate and that of his immediate fellow-workers. He has learned the lesson of co-operation within his trade, but he is not yet class-conscious. In answer to the argument based on the individual competitive establishment he asserts that the conditions which determine the income of the establishment are not the same as those which govern the wage-rate. Consequently, increase in the income of the establishment is no guarantee of increase of the wage-rate of the worker in it. Conversely, increase in the wage rate may occur without increase in the income of the establishment. Indeed, in consequence of this non-identity of the conditions governing establishment income and wage-rate, increase in the gross income of the establishment is often accompanied by decrease in the wage-rate, and the wage-rate is often increased by means which positively decrease the gross income of the establishment. The laborer's statements in this instance are without doubt well founded. The clue to the whole situation is, of course, found in the fact that the wage-rate of any class of laborers is not determined by the conditions which exist in the particular establishment in which they work, but by the conditions which prevail in their trade or "non-competing group." With this commonplace economic argument in mind, the reasonableness of the unionist's opposition to speeding up, and of his persistent efforts to hamper production, at once appears. Theory and trade unionism are almost contradictory terms. The trial and error method of testing rules, the ever changing conditions of the trade, the large number of men concerned in the agreement, the different nationalities represented in the union personnel, and the triennial agreements have left the carpenters' rules marked as if they are in a process. The constant changes in the agreements evince the carpenters' struggle to get control of the trade, first by one method or rule and then by another. This trial and error method has removed at least the trace of theory as a controlling force in the construction of the joint agreement. Journeymen are seldom conscious of any underlying theory of the rules in explaining their demands, methods, policies, and aims. Although the development of the rules has been free from the control of theorists, development has been in harmony with certain theories of business and human relationship. The theory of standardization, the theory of undercutting, the fixed group demand or lump labor theory, and the standard of living theory, are vital to the carpenters' rules. Journeymen may not realize the presence of any theories, nevertheless the officers interpret the rules in the light of these theories. To illustrate, one business agent said the rule prohibiting journeymen from taking their tools on the job before they were employed was to prevent men from gathering around the places of employment prepared to work, because the employers used their presence to intimidate the journeymen on the job; i. e., according to his theory of life, men who were out of employment would place themselves where they could underbid their fellows who were employed. To illustrate the underlying force of their fixed group demand theory, one of the officials said that they were in favor of a raise of wages to 70 cents per hour because there was a certain amount of work to be done and the carpenters could get 70 cents per hour as well as 65 cents. Thus consciously or unconsciously, the carpenters supported all of their rules by some of their theories of life. Let us consider these theories and their significance after careful analysis. The presence of an unemployed group and their theory of undercutting necessitates standards and uniform units of measurement. Thus the first of the hypothetical theories is accounted for. This assumption of the constant over-supply of labor also presupposes that there is a fixed group demand for labor, thus their theory of a fixed group demand or "lump of labor" theory. The third theory to be considered is that of the fixed group demand. This fixed group demand is usually approached through the desire to share work among their members, which they accomplish by limiting the supply of labor. Their rules on apprenticeship so limit the number of apprentices that it is said that only the sons of the most prominent journeymen are indentured. The number of apprentices range from one to two per cent of the number of journeymen. Rushing and excessive work have the same effect upon the supply of labor, through the limitation of the amount of work to be done in a certain time. The eight hour day and holidays limit the number of working hours and thus limit the labor supply. The fixed group demand theory is supported by their experience of unemployment. The leaders contend that the unemployed are as numerous under low wages as they are under high wages. The hypothesis is that there is a certain amount of carpentering to be done in Chicago. This is fixed by the number of persons who live there. To quote an official, "a man wouldn't live in a tent if wages were high nor in two houses if they were low." Of course this opinion would not bear strict interpretation nor do they claim that for it. The constant increase in the scale of wages and the accompanying decrease in unemployment in the trade are often cited as proof of their hypothesis. Their wage slogans, "high wages breed high wages," "no wage reductions," "cheap wages make cheap men," and "get more now," have their origin in this group of facts. Their fixed group demand theory explains the union's defense for limiting the output. The public press has frequently denounced trade unions for limiting the output. Employers have made most bitter attacks upon the union for those rules and practices which result in limiting the output. The opponents of trade unions on this point usually argue that prices to the consumer are thus raised, and charge the union with a breach of good faith with society. The business man, the entrepreneur, and the classical economist would usually undertake to solve the problem of unemployment by reducing wages with the hope that the demand for labor would be increased by reason of the decrease in wages. Not so with the trade unionist. He has a different theory of business. The former groups think that prices and demand vary inversely, the latter group thinks that "there is a certain amount of work to be done and a certain number of men to do it. Each should be given a chance to do some of it." In a few words, their theory is that there is a fixed demand for commodities regardless of price, within a reasonable limit. According to this latter theory, a man does not buy a straw hat because it is cheap, but because it is the custom of certain classes to wear a certain kind of hat on certain occasions. The increase in wages for the makers of high hats would probably not decrease the demand for that particular kind of hat. On the other hand the author of the foregoing reasoning admitted that he would buy an automobile if the price dropped to one hundred dollars and unwillingly admitted that his demand in the automobile market would increase the demand for mechanics. Neither of the above theories are valid if applied to the extreme, and are contradictory when so applied. The carpenters observe from experience that a change in wages is not followed by a corresponding change in demand for labor. They try to take advantage of this slowness of "demanders" to adjust themselves to a changed condition of supply. The union theory operates in these cases where the demand for an article does not fall when the price is raised, or in technical language, Where the demand is inelastic, and the opponents' theory operates in those cases Where the demand for an article falls off rapidly as the price is increased, or in technical language, where the demand is elastic. The demand for salt and carpenter work is almost fixed or "inelastic," and the demand for automobiles is quite elastic. Therefore the carpenters' and the employers' theories are both valid as you limit their applications and neither theory has universal applications. A proposal to adopt a single-payer healthcare system for California took an initial step forward Thursday when the state Senate approved a bare-bones bill that lacks a method for paying the $400-billion cost of the plan. The proposal was made by legislators led by Sen. Ricardo Lara (D-Bell Gardens) at the same time President Trump and Republican members of Congress are working to repeal and replace the federal Affordable Care Act…The bill, which now goes to the state Assembly for consideration, will have to be further developed, Lara conceded, adding he hopes to reach a consensus on a way to pay for it. Republican senators opposed the bill as a threat to the state’s finances. A high-profile effort to establish a single-payer healthcare system in California sputtered on Friday when Assembly Speaker Anthony Rendon (D-Paramount) decided to shelve the proposal. Rendon announced late Friday afternoon that the bill, SB 562 by state Sens. Ricardo Lara (D-Bell Gardens) and Toni Atkins (D-San Diego), would not advance to a policy hearing in his house, dampening the measure’s prospect for swift passage this year. “SB 562 was sent to the Assembly woefully incomplete,” Rendon said in a statement. “Even senators who voted for SB 562 noted there are potentially fatal flaws in the bill, including the fact it does not address many serious issues, such as financing, delivery of care, cost controls, or the realities of needed action by the Trump Administration and voters to make SB 562 a genuine piece of legislation.” Rendon took pains to note that his action does not kill the bill entirely — because it is the first year of a two-year session, it could be revived next year. But the move is nonetheless a major setback for legislation that has electrified the Democratic party’s progressive flank. It is good that this proposal is not dead and maybe much more work needs to be done. But California needs to lead the nation and Lord knows Washington D.C. is AWOL. There is much scorn of unionists by economists and employers because of this lump of labor theory with its corollaries. This scorn is based on the classical supply and demand theory and its variants. Supply is demand. Increased efficiency in production means an increase of social dividend and increased shares, which in turn increase production and saving. Therefore, the workers cut off their own noses when they limit output or limit numbers. The classical position is undoubtedly valid when applied to society as a whole, if there is any such thing, and in the long run. But the trouble is that, so far as the workers are concerned, there is no society as a whole, and no long run, but immediate need and rival social groups. The fixed group demand theory is as follows: The demand for the labor of the group is determined by the demand for the commodity output of the group. The community—wealth and distribution remaining the same—has a fairly fixed money demand for the commodities of a group. It will devote about a given proportion of its purchasing power to these commodities, that is, if the prices of the group commodity are higher, it will buy less units and vice versa, but expend about the same purchasing power. Therefore, the demand for the labor of the group, profits remaining the same, is practically fixed, and increasing the group commodity output means simply conferring a benefit on the members of other groups as consumers without gain to the group itself. Therefore, to increase the efficiency and the output of the group will not increase the group labor demand and group wages. Decreasing the efficiency and output of the group will not decrease the group labor demand and the group wage. Increasing the number of workers tends to decrease their bargaining strength relatively and to lower the total wage and the wage rate. Increasing the efficiency and the output of the workers is equivalent to increasing the group labor supply, and so tends to lower the group wage and the wage rate. Decreasing the number of workers tends to increase their bargaining strength relatively and so to increase the group wage and the wage rate. Decreasing the efficiency and output of the workers tends to increase their bargaining strength relatively and so to increase the group wage and the wage rate. The introduction of labor saving devices is equivalent to increasing the labor supply and so lowering the wage rate. Limitation of output through shorter hours, etc., i.e., decreasing the supply of labor, increases bargaining strength and tends to increase the wage. Strikes and trade union insurance funds are means of temporarily withdrawing labor supply and so of increasing bargaining strength and increasing wages. In practice the group demand theory is simply the application by the unions of the principle of monopoly, admittedly valid. But this theory only in part explains union efforts to limit both individual and group efficiency and output and to limit numbers. These policies in part rest on other theories and considerations. Robert F. Hoxie committed suicide on June 22, 1916. For an overview of his important but neglected contribution to economic thought see Charles R. McCann Jr. and Vibha Kapuria-Foreman, "Robert Franklin Hoxie: The Contributions of a Neglected Chicago Economist" Research in the History of Economic Thought and Methodology, Volume 34B, 2016. A not unexpected event has just been announced: 31-year old Prince Muhammed bin Salman bin Abdulaziz al-Sa'ud has been elevated from Deputy Crown Prince of Saudi Arabia by his father, 81-year old King Salman bin Abdulaziz bin Abdul-Rahman al-Sa'ud, to replace his 57-year old cousin, Prince Muhammed bin Nayef bin Abdulaziz al-Sa'ud. The former Crown Prince is Minister of the Interior, a position he inherited from his father, the late Prince Nayef, who was Crown Prince prior to current King Salman, but died before the most recent king, Abdullah bin Abdulaziz bin Abdul-Rahman al-Sa'ud died at age 90 in 2015, so Salman got to be king and now has moved his younger son up ahead of his somewhat older nephew. Muhammed bin Salman (MbS) is also Defense Minister, the position his father had taken in 2011 on the death of Prince Sultan, who was then also Crown Prince, with Salman prior to that serving as Governor of Riyadh province for 40 years. MbS has by all accounts been running things in Saudi Arabia recently, being behind the aggressive war in Yemen that has gone badly and also probably the main orchestrator of both Donald Trump's visit to Saudi Arabia and the move to diplomatically and economically isolate Qatar. Juan Cole describes MbS as being "sloppy" and "unwise," but he may be in position now to rule Saudi Arabia for a long time to come if this appointment is not reversed somehow by other members of the Saudi royal family. It is possible that the trigger for this elevation has been reports in the last few days of the US Secretary of State, Rex Tillerson, and Secretary of Defense, Mad Dog Mattis, turning increasingly against the campaign against Qatar pushed by MbS, despite Donald Trump's repeated support for it via Twitter. Not only did Tillerson sell Qatar a bunch of F-15s a few days ago, but yesterday Tillerson demanded that the Saudis and Emiratis (from UAE) present their specific demands of the Qatar regime. It has been two weeks since they initiated this campaign against Qatar, with the clear support of Trump, but indeed they have neither issued specific demands that by satisfying them Qatar could bring about an end to this diplomatic and economic embargo, nor have they presented a shred of evidence of the Qataris financing terror groups, the supposed justification for all this, although pretty much everybody knows that it is a more general annoyance by the Saudis with their not just going along with whatever the Saudis want as well as in particular the Qataris being too friendly with Iran, although even the anti-Iran Tillerson and Mattis realize that the US is allied de facto on the ground in the war against ISIS, which the Saudis have done near zero to support, not to mention Qatar hosting the US major air base that is being used in the campaign against ISIS/Daesh. Regarding the tangled relationships in the Saudi royal family, all these current players are descendants of the founder of modern Saudi Arabia, Abdulaziz, who died in 1953 after uniting Saudi Arabia and having 43 sons and over 100 wives, although never more than 4 at a time. Certain wives were more important than others and produced more important sons, with basically only three in play here regarding possible future succession to the Saudi throne. Currently in charge and looking to cement their hold are the 7 sons of Abdulaziz's favorite wife, his cousin, Hassa bint Ahmed al-Sudairi, the so-called Sudairi Seven, of whom only two remain alive, Abdul-Rahman who was once Deputy Minister of Defense but was removed from that position and the succession by arguing with other members of the family, and the current king, Salman. Of the others, the most important was Fahd who was king for over 20 years prior to Abdullah, dying in 2005, Sultan who long served as Defense Minister, and Nayef, father of the just deposed Muhammed from being Crown Prince. This current shuffle amounted to an intra-Sudairi Seven switch, with the Sudairis appearing to nail down a strictly hereditary line that is theirs. The main potential rivals would be the sons of late King Abdullah, the most important of whom, Mulab, succeeded his father as Commander of the tribally based Saudi Arabian National Guard (SANG). He might have the potential for pulling off a military coup, although the official military under the control of the new Crown Prince is probably more powerful, if push were to come to shove. However, it seems that he does not have all that much support from other top Saudi royals. Saudi royal family has followed since 1755. At age 16 in 1919, Faisal represented his father at the Versailles conference. He would later serve him as Foreign Minister and continued to do so even as king until his assassination in 1975 at the hands of a nephew. The most competent of the second generation was his son, Sa'ud, educated at Harvard, who served as Foreign Minister from 1975 until just before his death in 2015, then the longest serving foreign minister in the world, but he is not available being dead. Another candidate might be his 72 year old brother, Princeton-educated Turki, who ran Saudi intelligence from 1977 to 2001, when he stepped down 9 days before 9/11, with it being convenient that he had been the one who selected Osama bin Laden to go to Pakistan and fight the Soviets in 1979. Turki has since served as ambassador to both the US and UK and is now Chairman of the King Faisal Foundation, a very powerful body, but he has reportedly angered family members by being too vocal in criticizing certain policies publicly. More serious and reportedly a candidate for the succession when Abdullah died in 2015, is another Faisal son, Khalid, now Governor of Mecca, also educated in Princeton. He is widely respected, but at 77, well, the Faisals are just too old, and quite a lot of commentary about the new appointment of MbS is that he is a millennial, and this is the moment of the millennials taking charge there, even if it is a "sloppy" and "unwise" and highly aggressive one that is doing so. Frankly, this does not look good. Having a hot head running Saudi Arabia rather than a cool son of the late King Faisal could end up leading to a lot more bad things in an already much troubled Middle East. Addendum: One should be wary about Wikipedia information regarding members of the Saudi royal family. Some of it is inaccurate. Thus Wikipedia claims that Hass bint Ahmed al-Sudairi died in 1969, but she was not only still alive more than a decade later, but was for all practical purposes running the kingdom from a hospital bed through her powerful sons. Addendum, 6/22: Apparently Muhammed bin Nayef has made a recorded TV statement supporting his replacement as Crown Prince by Muhammed bin Salman. He has also been deposed as Minister of the Interior, no word on what else he might be doing, although no reports of jail or exile. Presumably they will treat him semi-decently if he continues to play along. Also, MbS is being portrayed as a sort of authentic "real Saudi," whom youthful Saudis really like, and who has this dynamic vision of the future (women will get more jobs, even if they still do not work with men). He was educated inside Saudi Arabia and apparently does not speak English very well, unlike all those snobby Faisals with their Harvard and Princeton educations. Also, he wears sandals, presumably the distinctively Saudi kind, rather than loafers. So, a real man of the people, even if hi is a sloppy hothead. Should Cultural Appropriation By Elvis Be Condemned? Probably I should not post something like this on Juneteenth, but I have become increasingly frustrated by what seems to me a very misguided discourse on cultural appropriation. While I think that there are cases that deserve condemnation, a great deal of what is being denounced I think should not be denounced. Indeed, without cultural appropriation I contend that we would have little culture of any sort worthwhile at all. Most culture is the result of cultural borrowings and fusions, not all of them well understood, at least some amount of cultural appropriation, if you will. Most of the time such cultural appropriation should be praised, not condemned (and movements on campuses to restrict such supposed appropriations and efforts to fire anybody associated with them should be condemned). So besides a lot of really stupid stuff on campuses about this, what has me moved to post this is the case of Elvis Presley, with posts recently floating around the internet and Facebook denouncing the late rock and roll singer for his reported cultural appropriation of supposedly authentically African-American rhythm and blues in his songs that helped create what is now known as rock and roll. I think he should be praised for what he did, which arguably was cultural appropriation, but there are a lot of other aspects of this case that I have seen few comment on. So, I am going to point them out here. The first is that if only those with ancestry from a group can use what are the cultural artifacts of that group, well, guess what, Elvis Presley almost certainly had African ancestry, even if as the son of a culturally white family born in the heart of the racist Deep South in Tupelo, Mississippi, he never made any mention of this likely fact overtly to my knowledge. It is not even clear that he used this term, but it is pretty much accepted that he had Melungeon ancestry through his mother, and he did apparently claim to have Sephardic Jewish as well as Cherokee Indian ancestry through her. While it is unlikely that there is much Sephardic Jewish input to the racial and ethnic mix that goes into the Melungeon population, and a long list of possible groups have been claimed including Portuguese and Turkish, there is no doubt that this group is a tri-racial group, with the largest components being various sorts of Europeans with African, and less Native American, but some. The origin of the group would seem to be intermarriages between indentured whites and blacks in Virginia in the mid-1600s, with these people moving into the mountains of Virginia while intermarrying with other groups, including at least some Native American Indians, with the current epicenter of this population being in Lee County in southwestern Virginia and neighboring Hawkins County, Tennessee. This group suffered substantial discrimination due to its mixed race background throughout the 19th century and well into the 20th century. In parts of southwest Virginia, regular white children would be threatened by their parents that if they did not behave, "the Melungeons will get you!" The first recorded use of the term dates to 1813 in a Baptist church document in Lee County, in which a woman is denounced for supposedly protecting a "Milungin" woman, which this woman heatedly denies, it obviously being something she did not want to be accused of. The unremittingly negative use of this term dated even until after Elvis died in 1977, with the first change coming with a country song in 1979 that presented Melungeons as semi-heroic figures and there now being a movement to praise them. Among those besides Elvis being possibly of Melungeon ancestry are Abraham Lincoln, Ava Gardner, Tom Hanks, Francis Gary Powers, and Bill Monroe of bluegrass fame. In any case, Elvis very much fits the stereotype of these supposed "straight-haired mulattoes," with his straight black hair and swarthy skin color. So, quite aside from the fact that Elvis might well legitimately be able to appropriate culturally African-American culture due to his almost certain African ancestry, there is another deeper matter. What he appropriated was already a cultural fusion of European and African, and what he added to that to help create rock and roll, a supposedly white country-folk input, was also a European-African fusion. So what he did was put one European-African fusion together with another European-African fusion to create a fusion of these two fusions, American rock and roll. Who can denounce that? On R&B, well, the rhythms are arguably African and much of the blues elements in melodic and tonal structures as well. However, the instruments and the underlying tonal forms are European. One runs into a similar pattern with jazz, although there is no question especially in the case of jazz that it was African-Americans who created it, as is the case of the blues part of R&B. However, one finds blues elements as well in country-folk music, the supposedly white music. While the largest input into the country-folk tradition comes from the British Isles, there are other African elements, not just the blues part,but also certain instruments, most notably the banjo, which is an instrument that came almost straight and unchanged from Africa. Given this latter fact it is a bit odd that it is an instrument now essentially never played by any African-Americans. It is as authentically African as you can get. So there it is. Rock and roll is a fusion of two fusions. We should thank the late mixed race Elvis Presley for his role in bringing about this fusion of fusions to create the most authentically American music of them all. And a happy Juneteenth to one and all. Is Trump's Apprenticeship Program Like His Infrastructure Program? It looks like it might be in a crucial way. Both involve lots of rhetoric about expanding programs that many support, apprenticeships and infrastructure. However, on looking at them closer to the extent we can see anything specific aside from the rhetoric, it looks like they involve actual cuts in funding support for existing programs related to both apprenticeships (and more broadly worker training and retraining) as well as for in-process infrastructure projects such as those funded by CIG, in favor of vague plans for some sort of private support for these programs, apprenticeships or infrastructure. As it is, it looks like the rhetoric and privatization proposals for apprenticeships are much vaguer than those for infrastructure. For the latter we have had the specific proposal to privatize air traffic control, a proposal that has previously gone before Congress only to draw opposition from GOP senators, not all of those yet on board, along with supposed tax breaks for privatizing other parts of the infrastructure. What is supposed to constitute the support for the private replacement for the currently publicly supported apprenticeship programs is much less clear, although one suspects that it will be the usual GOP panacea, some tax breaks. I suspect that we shall have to wait and see, which is ironic given that supposedly Trump was pushing this recently at least partly to distract us all from his self-incrminating tweets, but those tweets have so distracted his own administration that they seem increasingly unable to formulate any sort of detailed or concrete plan for any real policies, if they ever were able to do so. And this latest rhetoric on apprenticeships is just another embarrassing example of this floundering incompetence. In the last few days it has come to pass that twice US Secretary of Defense, James "Mad Dog" Mattis has shown himself to be the only adult in the room in the Trump administration. His first such exhibition of adulthood came during the bizarre spectacle of Trump's first full televised cabinet meeting. Trump openly demanded verbal obeisance from those assembled, promptly delivered by all but one in the room, with some of them embarrassingly effusive, such as Reince Priebus declaring it to be a "blessing" to serve Trump. Ugh. Even SecState Tillerson chimed in with a relatively perfunctory bit of praise for Trump. Only Mad Dog Mattis refused to go along, making a statement praising US military personnel around the world without a single word about Trump. And then we have the underreported event yesterday that I saw on Juan Cole's blog that Mattis signed a $12 billion dollar deal for F-15s with Qatar. Now I am not in general a big fan of these Middle East arms deals with anybody, but in this case this blatantly goes against Trump's absolutely stupid and probably corrupt (Saudis paid $270,000 in hotel bills at Trump's hotel in Washington since Trump took office) support for the Saudi move to blockade Qatar and pressure it into going along with Saudi aggression in Yemen and more generally against Iran. Both Tillerson and Mattis made verbal statements last week arguing for a more balanced approach there, only to have Trump double down on supporting this very stupid policy. Tillerson is not able to cut deals independently supporting Qatar, but Mad Dog Mattis has just done so. Maybe Trump will fire him, but I kind of think that maybe even he is not quite that stupid in the current circumstances. So there we have it, having to thank somebody nicknamed "Mad Dog" twice in a few days for being the much=needed adult in the room. Nina Shapiro presents a must read entitled the “Hidden Cost of Privatization”. I will not even attempt to do its excellent discussion beyond noting some conservatives what to pretend that the only public good is national security but she makes the case that roads are also a public good. Guess who also made that case? India has reported GDP growth of 7% for the December quarter. That's just not a number I believe I'm afraid, not when we try to consider the effects of demonetisation. Read this rest of this at your own peril. To be honest, I got a little bored with it all. Spicer just now said India has enjoyed 7% growth but then he claimed that India’s GDP now is 6 times what it was 16 years ago. But that would require a 12% growth rate as a 7% growth rate would have only tripled real GDP over this period, which is approximately what has happened. Of course India’s nominal GDP may be 6 times what it was since the beginning of the century given that its inflation rate has averaged near 5%. Look – I doubt Spicer gets any of this. It is more likely someone else in the White House gave him these misleading talking points. Why? I have no idea. But I was amazed that not one of the reporters picked up on this absurd spin. Yes – we need smarter reporters. So in the case of Germany, I do think Germany is the world’s greatest mercantilist power right now. It used to be China. China’s surplus has gone down in recent years, but Germany’s trade surplus is almost 9 percent of GDP. And they are essentially exporting deflation and unemployment to the rest of the world. I think the damage, though, is done to the rest of Europe and not the United States. In addition, it is not a trade problem. It is a macro-economic problem. The solution is to get German consumers to spend more and save less and the German state to spend more and to increase German wages. It is not the trade policies of the US or any other country that is going to be able to address this issue. It is similar to the way Trump has picked up grievances about how trade agreements have operated in the United States. These agreements have created loses, and grievances that have not been addressed, and I think there is a lot of truth to those kind of things, but I don’t think he has any realistic way of dealing with those things. Yes, but I don’t put it on the top of our concerns. There have been times when it is a bigger issue. The U.S. could use more aggregate demand and one of the places it could come from is smaller trade deficit. But you could get the same result more effectively through a more aggressive fiscal stance on the part of the federal government and the states, particularly through expenditure on infrastructure. I do think the low labor force participation is something we should try to bump up and I think there is a place for increasing demand. A lower trade deficit might contribute a little bit to raising it, but I don’t think it’s where the major action is. I’m all for more infrastructure investment – in fact, a lot more. Of course there are couple of qualifiers here. One – if you got a lot more, we probably need to raise taxes to offset any excessive fiscal stimulus. But secondly – it seems this agenda has been put on hold unfortunately. But Dani generally is right – we need a bit more aggregate demand. Rather than use trade protection which will likely strengthen the U.S. dollar with the usual result that net export demand on net will not change, let’s try something novel. I’m talking about lowering U.S. interest rates. Yes – I know the Federal Reserve seems hell bent on doing the opposite but that is a mistake. The ECB has been pursuing an aggressively easy monetary policy which has devalued the Euro with respect to the dollar, which of course raises German net exports and lowers our net exports. If the Federal Reserve reverses course and lowers interest rates, we could get a much needed devaluation of the dollar. So, Prateet Agarwal of The Intelligent Economist has issued his list of the top 100 economics blogs for 2017. Econospeak is on the list, which does not rank them but rather puts them into different categories, with us being in the financial economics category, for better or worse. There are some oddities in our description, including the erroneous claim that Max Sawicky is at the Economic Policy Institute, which he once was quite some time ago. It is also claimed that one needs "a strong economics background" to read Econospeak, which I think is a bit overdone. Lots of other blogs are described as being well written and easy to read, but, well, I haven't seen us bogging things down with lots of equations and theorems too much. I think Agarwal must have showed up when Egmont was plying us with his axioms, :-). Anyway, we are there, for better or worse. Oh, I note that Angry Bear is on the list also, categorized as a General Economics blog. There is a lot of overlap between us and them, with Dan Crawford frequently reposting stuff we put up onto their blog. Trump's "one-hundred percent" is free floating. 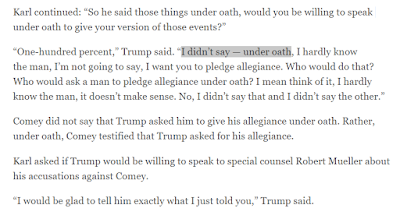 His two uses of the phrase "under oath" indicate that a misinterpretation or pretended misinterpretation of the question as being whether he asked Comey to pledge his loyalty under oath. 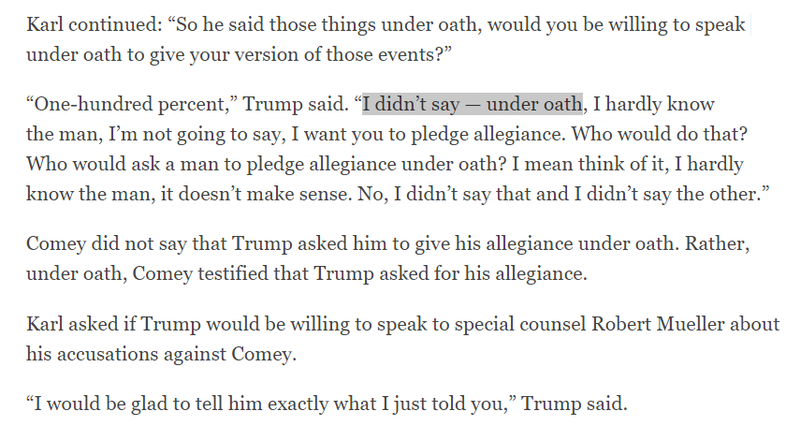 So his "one hundred percent" is simply a one hundred percent denial that he demanded that Comey pledge allegiance to him under oath. There is no commitment in the exchange to testify under oath. Of course, even if Trump had committed one hundred percent to testifying under oath, there would be no way to compel him to honor his commitment and he almost certainly would not do so. Trump will not testify under oath and he will not release his tax returns. A Personal Observation On Trump's "Infrastructure Week"
Yes, folks, you may have already forgotten it, but this has officially been Trump's "Infrastructure Week," highlighted by his proposal to privatize air traffic control in the US, and his trip to Cincinnati where he in general terms talked about the supposed virtues of privatizing highways, bridges, and airports, While he claims he wants to provide up to $200 billion in federal funding to draw forth a supposed $800 billion in private funding, the last time I checked his proposed budget supposedly cuts infrastructure funding. So much for that big infrastructure boost! As it is I want to comment on the proposal to privatize highways. I shall briefly note that privatizing air traffic control might not be a bad thing, assuming that it is done properly. Canada did so some years ago, and most reports have it that this has worked out pretty well. Maybe it would in the US as well, although my confidence in Trump not to mess it up is pretty low. Anyway, back to highways. There has been some effort to do this in some states recently, with decidedly mixed results. But my observation is that over the longer haul it seems that outside of gated communities or private property, this does not work very well. The historical record in the US is that if one goes back a few centuries, one finds many roads that were originally built and run by private companies. Nearly all of these eventually reverted to some sort of government control at one level or another. In particular in Virginia where I live, there were quite a few build in the 1700s, but during the 1800s they pretty much all reverted to some sort of government control. The private sector just did not do all that good of a job running them. So, where is the personal angle in this? Last weekend I learned that the street behind my house here in Harrisonburg, VA, Bruce Street, a minor street that is one way and in my block only has houses backing up to it, was once one of these privately owned highways that was later taken over by the city. I learned this while visiting with my daughter Sasha the oldest building in Harrisonburg, the Thomas Harrison House, which was originally the private residence built probably in 1770 of the person for whom the city is named. It is a small limestone structure that has not been previously opened to the public like this, but the city has taken ownership of it from the Methodist Church across the street that had owned it for a long time (it had been used as a law office most recently). The city is planning on turning it into a museum, and they have had archaeologists from James Madison University excavating its basement, which was used as a kitchen during the days the structure was a house (up until the 1840s). Anyway, they decided to open the basement up for the public to see as well as the many objects they have found there, including lots of animal bones. So, visiting daughter and I made the visit to check it out. The main archaeologist, Carole Nash, is a good friend and gave a most informative talk. And that is where I learned about the history of Bruce Street, which is now only about 7 blocks long, cut off at one end by an elementary school and at the other by a public park. Anyway, the Thomas Harrrison House is located just off the intersection of Bruce Street and Main Street, which also happens to be US 11, a highway that runs from Montreal to New Orleans, the old overland route of the French empire in North America (it is not called "US 11" on the other side of the Canadian border). Now it happens to be the case that old timers here in the Shenandoah Valley call US 11, the "Valley Pike," short for turnpike. And indeed it was one of those highways that was originally built by a private company that collected tolls on it, until it was taken over by the federal government in the 1800s. The word "turnpike" comes from the barrier at the toll booths back in those horse and buggy days. A stick would would be stuck in the ground that could be turned and it would have another stick that would cross the road blocking it. When people paid their toll, the toll keeper would turn the turnpike allowing them to proceed further. Indeed, at least in Virginia one finds streets and roads that are actually called "turnpikes," and nearly all of them have this history of being once privately owned and run, but since taken over by some level of government, with Little River Turnpike in Northern Virginia being one such (I think in its case it is owned by the Commonwealth of Virginia, but not sure). But I had never heard anybody talk about the not very long or impressive Bruce Street as being a "Pike." But in fact as Carole informed us, in 1770, ten years prior to Harrisonburg being officially founded as Rocktown, that intersection was the main one in the area, the intersection of two major highways in the Valley, the Valley Pike, now US 11, running from southwest to northeast (or vice versa, if you prefer) and the road that was then called the Warm Springs Turnpike, indeed another privately owned and run highway, later taken over by the city and turned into the minor Bruce Street perpendicular to the now Main Street. Carole indeed confirmed that this was its history, and it was clear that Mr. Harrison very consciously located his house near this intersection, where it also happens to sit on top of a spring, which we saw in the basement, houses back then usually being built that way so that they could withstand a siege by Native Americans (this was only a few years after the French and Indian War, the last battles of which took place in the Shenandoah Valley in 1764, the year after the war supposedly ended). So, both the Valley Pike and the Warm Springs Turnpike in Harrisonburg are examples of highways once built and run privately, but since taken over by government. The long term record is not all that favorable for privately owned highways that go any distance. Addendum on June 13: I have done some further digging on the details of the history here, and some of the above is not quite accurate, although the general story of privately built roads in Virginia getting turned over to various units of government holds, indeed is pretty darned impressive. So, there were no organized systems of road provision or maintenance in 1770 in the Shenandoah Valley when it appears the Thomas Harrison House was built. Nevertheless it was at the intersection of the two main trails that were being used at that time. The establishment of private companies to build "plank roads" (out of wood) on these trails would occur in the 1830s, 1830 for the Warm Valley Turnpike Company, and in 1836 for the Valley Turnpike Company. I do not have the date of the ending of the latter (although I can find it out), but the Warm Springs Turnpike Company ceased to exist in 1901, after which that road became owned by different levels of government for different parts of the turnpike. As it was, the part of Bruce Street that goes behind my house one and a half blocks east of the intersection in question was never part of the turnpike. It turns out that the intersection was its northern most endpoint. It headed west along Bruce Street but then turned southwest to follow what is now Virginia 42 for awhile and then other roads to finally end up in, big surprise, Warm Springs VA in Bath County, which is a site of bath houses, although Hot Springs a bit south of it is more famous as the site of the Homestead Resort, visited famously by Thomas Jefferson. My source for all this is a Wikipedia entry on "Turnpikes in Virginia and West Virginia" that shows that during the 1800s there were well over 100 of these private companies formed to build or run turnpikes. For the majority of them, there is no information on what they did or when they were founded or what happened to them, but for many there is considerable information on when and how and what current roads are what the built or run. The bottom line holds. All of those many roads are now in the public sector, so the bottom line conclusion still holds, despite my having certain historical details a bit off. Another Addendum, 6/15: This is strictly amusingly personal, but yesterday there was a bear "lumbering" or "traipsing" or just plain "ambling" one block over from Bruce Street on Newman where Carole Nash lives, until animal control officers got it under control. Big joke is that some people on FB claimed that maybe it was actually Carole's large and very furry brown Tibetan mastiff, Artemis, but Carole assured people that Artemis was inside at the time. And anyway, the bear was black, not brown, :-). Yet More, 6/17: I saw the arehaeologist, Carole Nash, this morning at our farmers' market, and she assured me that the bear was for real, apparently a young male, and that it ran up their street. Apparently after it went into the historic Woodbine Cemetary, it crossed US 33 (aka Market Street) heading north. It was finally apprehended and stunned on Wolfe Street to be taken out of town somewhere. And that I think will be the final word on that, :-). "It Depends on How We They Value Time"